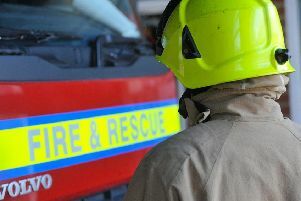 Five fire crews have spent this afternoon (Wednesday) containing field on fire near Metheringham. Crews from Metheringham, Sleaford, Billingborough and two from Lincoln were needed to dealing with the blazing field of corn alongside the B1188 at Metheringham Heath Lane. The incident was reported at 1pm and a fire service report states that 40 acres of cut straw, stubble, hedge rows and a tractor were caught up in the fire. The firefighters used six hose reels, beaters and breathing apparatus to extinguish the flames.